Th-INK-ing of You: The end of worry! Hello friends! I hope you are all doing well! It's a beautiful day here in NC and I'm enjoying the warm temps before it once again takes a dive down for the weekend! We have planted our cool weather plants already and it's supposed to go below freezing Sat.- Sun. so we'll have to remember to cover the tender plants! Anyway... I actually made this card a few days ago, but just didn't have time to post it here yet. It is made with one of the sentiments from the newly released ODBD Anniversary set, God Quotes. 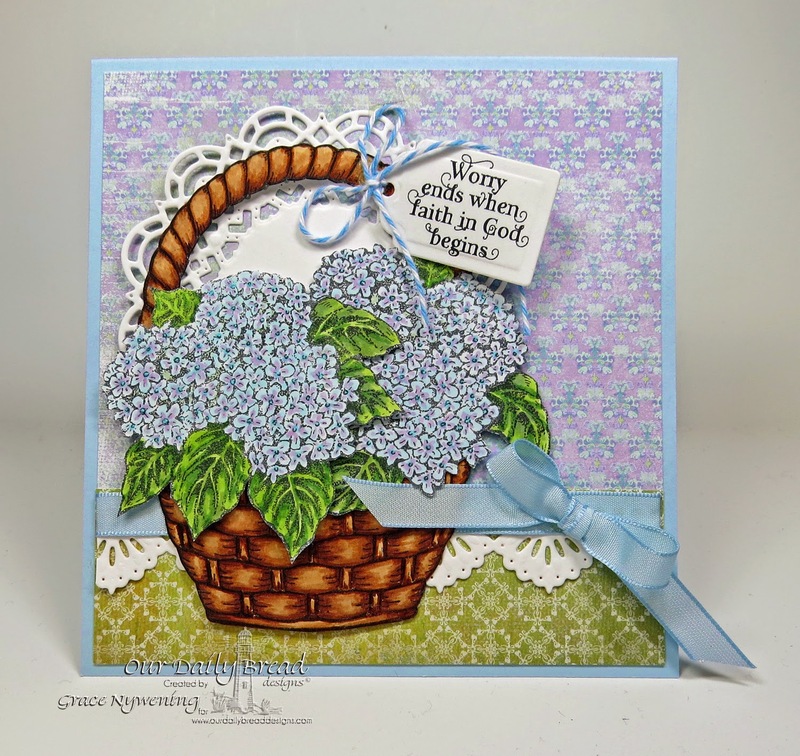 I also used the Hydrangea flower single stamp, and Basket of Blessings for my basket. I stamped and colored the hydrangeas twice, using Copics for coloring, and then I fussy cut them and popped them up on my basket image, also colored with Copics. I cut the sentiment with a tag from the ODBD Custom Recipe Card and Tags die set, and added a pretty lacy border from the Beautiful Borders Die set. The designer paper is Memory Box Frond, and the card stock and ribbon is SU! Bashful Blue. A white doily, cut with the ODBD Custom Doily Die serves as a backdrop and a little bakers twine secures the tag to the basket handle. It's pretty quick to make and yet doesn't feel overly simple. I hope it will brighten someone's day! "So we do not lose heart.... For this momentary affliction is preparing for us an eternal weight of glory beyond all comparison." I'm currently beginning a new kind of treatment for my pain issues. It's easy to get discouraged and even to worry about things like our health, finances, family issues, the state of the world around us, etc. This verse reminds us that whatever we are going through right now is temporary, and it's preparing us for something more wonderful than we can even comprehend! Let's ask Him to show us how we can use our temporary afflictions to bring Him glory! Thanks so much for stopping by! Have a wonderful rest of the week!!! This is stunning Grace! The flowers are beautifully colored and the fussy cut... Thank you for sharing the encouraging words. Hugs, Gracie. Absolutely beautiful Grace, and it has already brightened my day. May God give you buckets of grace to cope with the pain issues. God Helps Us handle what we are given! Welcome to ODBD's Anniversary Release Blog Hop! Welcome to the ODBD March release!